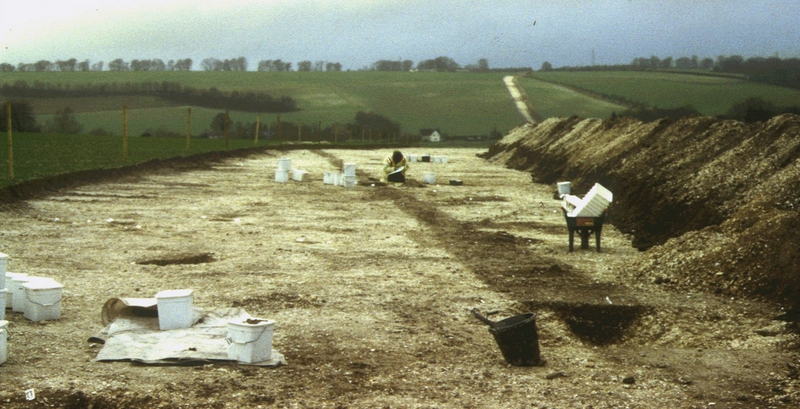 In 2001 and 2002 Wessex Archaeology undertook an archaeological excavation in advance of the replacement of a water pipeline to the north of Salisbury. The work was commissioned and funded by Wessex Water. The pipeline runs for 4.5 km from the Camp Hill Reservoir, passing north of the scheduled monument of Old Sarum to the Castle Hill Reservoir, with a branch continuing east towards Ford village. The pipeline crosses a rich archaeological landscape with evidence for Neolithic pits and a long barrow, Bronze Age barrow cemeteries and field systems, as well as Iron Age, Romano-British, and medieval settlements. The hillfort at Old Sarum was built during the Early Iron Age, and was the possible site of the Roman town of Sorviodunum, when up to four Roman roads converged outside its east gate. The site continued to be occupied in the Saxon period, but was substantially re-modelled after the Norman conquest with the construction of a motte-and-bailey castle, the strengthening of the defences and the building of a cathedral, later rebuilt in 1130. The abandonment of Old Sarum began in the early 13th century when the bishopric was moved, in 1219, to the new city of Salisbury to the south. The report on the excavations was published in 2005 in The Wiltshire Archaeological and Natural History Magazine 98, 250−80. The full specialist reports for the project may be downloaded by clicking the links below.